Updating the Software on Your Alpha 100 System. One of the things that changes on a pretty regular basis is the Alpha Software. The Garmin engineers make improvements in the software all the time. Most folks don't know it, but you can update the software in both your Garmin Alpha Handheld and your TT Collar to the most current version by logging onto Garmin's website. 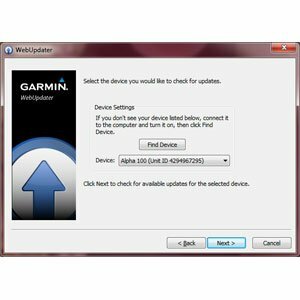 Before you begin, you will need to go to Garmin's website and download their "WebUpdater" software. Once you have installed the software on your computer, updating the Alpha 100 Handheld and TT Collar is pretty easy. 1. Connect it to your computer with the USB cable and run the WebUpdater software. 2. It will automatically detect your Alpha 100 and prompt you through the process step by step. IMPORTANT NOTE: The GPS software in the Astro handheld is maintained separately from the main unit software. The GPS software controls how satellites are received and tracked while the unit software controls how the unit functions in terms of the user interface and tracking dogs. When running Webupdater, it will update the main unit software and then ask if you want to check for additional updates. The additional updates section is where GPS software updates are located, and we recommend you check for these updates when you update your handheld main unit software. 1. Attach the charging clip to your TT15 collar. 2. Attach the USB cable to the charging cable. 3. Plug the USB connector into your computer and run the WebUpdater software. 4. It will automatically detect your Alpha TT 15 Collar and prompt you through the process step by step. 1. Attach the charging clip to your TT 10 collar. 2. Connect the USB cable to the charging clip. 4. It will automatically detect your Alpha TT 10 Collar and prompt you through the process step by step.